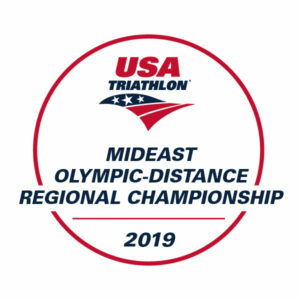 Just minutes from historic Williamsburg, VA and next door to the original Jamestown Settlement, the Jamestown Triathlon is a great mid-season Sprint/Olympic race. The swim takes place at beautiful Jamestown beach where you can watch Osprey catch their breakfast or see a pod of dolphins swim along the course. The bike course is flat, fast and parallels the Cap-Cap bike trail along Rt. 5. The run course is simply amazing as it winds through historic farmland and forest on a combination of bike paths and jogging trails. Be sure to stay for the weekend to experience all that the greater Williamsburg area has to offer, including the new Billsburg Brewery, the Jamestown Settlement and so much MORE. Not sure if you should register? 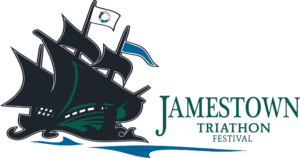 Well, check out these videos from the Jamestown Triathlon HERE then sign up below. Swim Course brought to you by Sail Time: The swim course is a 1500 meter rectangular course in the brackish James River and starts on the newly refurbished and extremely popular Jamestown Beach. The majority of the course is parallel to shore and the water ranges from 6-10′ deep. This is a beautiful area to visit and there are kayak rentals onsite. The water temperature is expected to be in the mid to upper 70’s with a preliminary water temperature will be posted on the website the Thursday prior to the event. An official reading will be taken race morning. Click HERE for real time water temperature updates. Bike: The bike course is very fast and mostly flat. The largest elevation gain/loss is when crossing the Chickahominy river bridge. At mile 10.75 athletes turn left onto a low traffic road to get the remainder of the distance prior to turning around and coming back to the transition area. This is an out and back course, however athletes exit and enter the park via two different entrances. Run: The run is pancake flat and the beginning is on an asphalt bike path that parallels the bike course. This course includes many of the shaded, packed gravel trails that are used for the Patriots Half in September. Running in the woods is cool, running in the woods on well maintained paths is even better. There will be aid stations every mile on the course serving ice water and Gatorade. Swim Course brought to you by Sail Time: The swim course is a 750 meter rectangular course in the brackish James River and starts on the newly refurbished and extremely popular Jamestown Beach. The majority of the course is parallel to shore and the water ranges from 6-10′ deep. This is a beautiful area to visit and there are kayak rentals onsite. The water temperature is expected to be in the mid to upper 70’s with a preliminary water temperature will be posted on the website the Thursday prior to the event. An official reading will be taken race morning. Click HERE for real time water temperature updates. Bike: The bike course is very fast and mostly flat with minimal turns outside the park. Athletes will turnaround on Rt. 5 prior to crossing the Chickahominy Bridge. This is an out and back course, however athletes exit and enter the park via two different entrances. Run: The run is pancake flat and is on an asphalt bike path that parallels the bike course. There will be an aid station at the start of the run and at the turnaround point. Aid stations for the sprint will have water and ice. The 5K course is mostly open and does not have a lot of shade. You’ll love our swag! 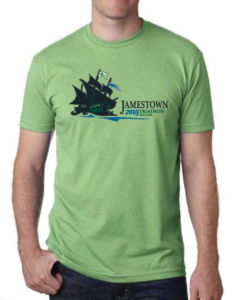 All athletes receive a Tri-Blend Race Shirt, Custom Race Socks and a super cool custom Jamestown themed Finisher’s Medal. Also, don’t forget the DJ, bounce house for the kids and fabulous post race spread. Are you new to the sport of triathlon and a bit nervous? Check out our training page so we can get you connected with a coach, club or training group to get you to the finish line. Beer Tent: All athletes 21 and up have access to the post race beer tent. Pre Race Meeting: An extensive pre-race meeting will take place at 6PM on Saturday. If this is your first race, come to this meeting to have your questions answered. A second brief meeting will occur 15 minutes prior to the first wave on race morning. We are proud to partner with Apex Sports Travel to secure the absolute lowest prices on Williamsburg area lodging and activities (Can you say water country post race?). There is so much to do in Williamsburg, we recommend making a weekend of it. Click HERE for more information.